NEW DELHI, India (CNN) -- A stifling heat wave gripped more than a dozen states across India Friday, pushing the mercury to record levels in some areas. 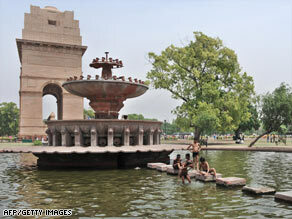 School children swim in a pond to beat the heat in front of India Gate in New Delhi on April 28. The India Meteorological Department warned of "severe" heat in the western desert state of Rajasthan and in the northern hill state of Uttrakhand. The bulletin said at least a dozen more states were also in the grip of a heat wave. The highest temperature of the summer -- 117 degrees Fahrenheit (47.5 degrees Celsius) -- was set Thursday in Khandua in the central state of Madhya Pradesh, said B.P. Yadav, with the weather service. The punishing heat has claimed at least 15 lives in the country's east, officials said Friday. "Fifteen people have been confirmed dead from the heat wave," said Snehalata Bhuyan with Orissa state's disaster management department. The intense heat has scorched the region since March. Authorities have investigated some 67 suspected heat-wave deaths, Bhuyan said, and found at least 15 of them related to sun stroke. Forecasters expect the severe heat to continue for at least two more days.